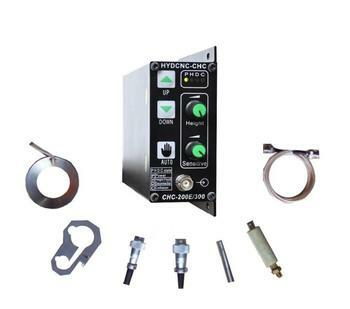 It is the newest cap THC we designed for flame cutting, stand alone type, support any cnc controller, widely used by almost China manufacturers, include Koike China, Messer China, AMG...etc. It works with AC24V, support DC 24V motor below 100A. 1, Increased more indicators to shows different states of THC. 2, Output of collision-alarm, which is optical isolation output from THC, can be sent to CNC’s Alarm input to freeze machine’s move. This signal is effective on both manual/auto mode. The max output is 200mA, capable to drive most relays. 3, Anti-collision function. On manual/auto mode, when metal or low-conductive item like hand touches sensor ring, THC would send out collision signal and lift torch up until no collision exist. 4, When HF cable is disconnected or weakly connected, it would be indicated on the disconnection indicator. So after installation of HF cable, just shake the HF cable, the connection will be showed by the indicator. 5, Sensitive and Accuracy is increased 100%. 6, CHC200E uses digital logic control circuit for logic control, greatly improved anti-interference performance.